The fire, which started at the storage unit on the ground floor of a two-storey building, ripped through the structure, officials said, while adding that Ten women and seven men were killed. 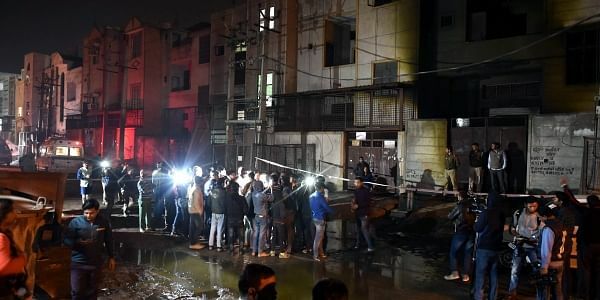 NEW DELHI: Seventeen people were killed and two injured in a massive blaze at a firecracker storage unit in outer Delhi's Bawana industrial area this evening, a Delhi Fire Services official said, even as the city government ordered an inquiry into the incident. The fire, which started at the storage unit on the ground floor of a two-storey building, ripped through the structure, the official said. Ten women and seven men were killed, another fire official said, noting that a man and woman have been injured. The two injured have been admitted to a hospital. The police also confirmed 17 people were killed and said an FIR has been registered. An investigation is on to ascertain the cause of the blaze, they said. The Delhi Fire Services received a call about the fire at the factory around 6.20 pm and 10 fire tenders were rushed to the spot, the fire department said, adding the blaze has been brought under control. G C Mishra, Director, Delhi Fire Service, said the building comprised a basement, ground floor and two upper floors. "One body was recovered from the basement, three from the ground floor and 13 from the first floor. One person sustained fractures after he jumped from the second floor to save himself," he said. Mishra said the fire was doused by 9.20 pm but search and rescue operations were underway. "We are taking no chance. We don't have a definite number of people who were in the building when the fire broke out," he said. The police said the people were either charred or got choked to death. Prime Minister Narendra Modi expressed anguish at the death of people in the fire. "My thoughts are with the families of those who lost their lives. May those who are injured recover quickly," the Prime Minister's Office tweeted quoting Modi. The Delhi government ordered an inquiry into the blaze even as Chief Minister Arvind Kejriwal said he was keeping a "close watch" on the rescue operations. "V(ery) sad to hear abt large no of casualties. Keeping a close watch on rescue operations," he said in a tweet. Delhi Urban Development Minister Satyendar Jain said an inquiry has been ordered into the incident. "Learnt about a serious fire incident in a private factory at Bawana. Several casualties reported. Monitoring the situation. Ordered enquiry," Jain tweeted. North Delhi Mayor Preety Agarwal rushed to the spot to take stock of the situation. "The factory falls in the Delhi State Industrial and Infrastructure Development Corporation (DSIIDC) area," a senior NDMC official said. The medical superintendent of Dr Babasaheb Bhimrao Ambedkar Hospital said, "We have received a disaster alert and we are prepared to handle the rush of injured patients."